Iodine is found in trace amounts in human body and its only function is thyroid hormone synthesis which is responsible for regulation of metabolism. The recommended dietary allowance of iodine is approximately 150mcg/day in adults and adolescents, 250 mcg/day in pregnant and lactating women. Iodine is primarily obtained through diet. Sources include, salt water fish, seaweed and minimal amounts in grains. About 29% of the world's population, living in approximately 130 countries is estimated to live in areas of iodine deficiency. This occurs primarily in mountainous regions. In India, approximately 200 million people are at the risk of iodine deficiency while the number of people suffering from iodine deficiency disorders is above 70 million and about 337 districts are endemic with prevalence more than 5%. Malnutrition is one of the biggest challenges being faced by developing countries. Micronutrient deficiencies commonly referred to as 'hidden hunger' form a significant component of malnutrition in developing countries. Iodine, iron, folic acid and zinc are the micro nutrients commonly found to be deficient. 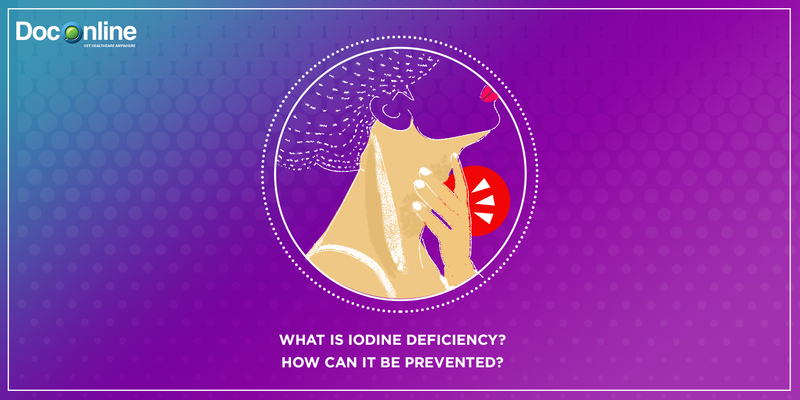 Iodine deficiency is the most common cause of goiter in the world. The spectrum of diseases includes goitre, cretinism, hypothyroidism, brain damage, abortion, still birth, mental retardation, psychomotor defects and hearing and speech impairment. Women with severe iodine deficiency are likely to experience infertility, pregnancy in this group may result in miscarriage and congenital anomalies. Thyroid hormone is essential for fetal brain growth and development, and severe iodine deficiency in the pregnant female may lead to mental and growth retardation or cretinism in the offspring and even mild maternal iodine deficiency has been associated with lower IQ in children. Goiter is the enlargement of the thyroid gland, which begins as an adaptive process to low iodine intake. Goiter can be multinodular and few of the nodules may autonomously secrete thyroid hormone causing hyperthyroidism whose symptoms include anxiety, weight loss, increased appetite, palpitations etc. who require anti thyroid medications. When iodine deficiency is more severe, thyroid hormone production falls and patient develops hypothyroidism whose symptoms include weight gain, decreased appetite, hair fall, lethargy, menstrual irregularities etc. and such patients require thyroid hormone supplementation. Congenital hypothyroidism in fetuses born to hypothyroid mothers prevents central nervous system development and maturation resulting in permanent mental retardation, neurologic defects and growth abnormalities. Long standing goiters are a precursor for development of thyroid cancer, especially Follicular type of thyroid carcinoma. Fortification of salt has been used to curb the iodine deficiency prevalence. Salt has been chosen as the medium because its intake is uniform across all socio-economic strata and across all seasons of the year and the process involved is simple. The recommended salt iodine fortification level is 15 parts per million(ppm), which provides the daily required iodine of 150 mcg assuming daily consumption of salt to be 10 grams. Though small, diffuse goiters of short duration can be managed effectively with iodine supplementation, however, large nodular goiters and cretinism cannot be reversed. "Diet cures more than doctors do. So, do not fall prey to iodine deficiency as the solution is simple-consumption if iodized salt."